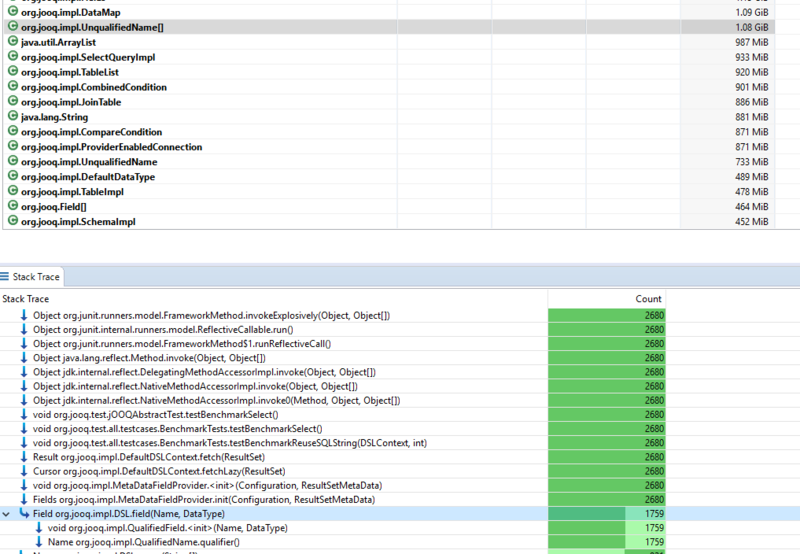 Squeezing Another 10% Speed Increase out of jOOQ using JMC and JMH – Java, SQL and jOOQ. In this post, we’re going to discuss a couple of recent efforts to squeeze roughly 10% in terms of speed out of jOOQ by iterating on hotspots that were detected using JMC (Java Mission Control) and then validated using JMH (Java Microbenchmark Harness). This post shows how to apply micro optimisations to algorithms where the smallest improvement can have a significant effect. While JMH is probably without competition, JMC could easily be replaced by JProfiler, YourKit, or even your own manual jstack sampling. I’ll just use JMC because it ships with the JDK and is free for use for development as of JDK 8 and 9 (if you’re unsure whether you’re “developing”, better ask Oracle). Rumours have it that JMC might be contributed to the OpenJDK in the near future. In a previous blog post, we’ve discussed common techniques of optimising such situations. In this blog post, we’ll look into a couple of concrete examples. How to discover flaws in these loops? We’re looking for the problems that affect all users, the kind of problem that, once fixed, will improve jOOQ’s performance for everyone by e.g. 10%. This is similar to what the JIT does, by performing things like stack allocation, inlining, which don’t drastically improve things locally, but do so globally, and for everyone. Here’s an interesting guest post by Tagir Valeev on JIT optimisation, and how good it is. The first option is to run profiling sessions on benchmarks. We could, for example, run the entire “S-E-R-C loops” in a JMC profiling session, where the “S-loop” is a loop over all our statements, or in other words, over all our integration tests. Unfortunately, with this approach, our “E-loop” (in the case of jOOQ’s integration tests) is a single execution per statement. We’d have to run the integration tests many, many times in order to get meaningful results. Also, while the jOOQ integration tests run thousands of distinct queries, most queries are still rather simple, each one focusing on an individual SQL feature (e.g. lateral join). In a end user application, queries might use less specific features, but are much more complex, i.e. they have a lot of ordinary joins. This technique is useful to find problems that appear in all queries, deep down inside of jOOQ – e.g. at the JDBC interface. But we cannot use this approach to test individual features. Another option is to write a single test that runs a few statements (small “S-loop”) many times in an explicit loop (large “E-loop”). This has the advantage that a specific bottleneck can be found with a high confidence, but the drawback is: It’s specific. For instance, if we find a small bottleneck in the string concatenation function, well, that is certainly worth fixing, but doesn’t affect most users. This approach is useful to test individual features. It can also be useful for finding issues that affect all queries, but with a lower confidence than the previous case, where the “S-loop” is maximised. Creating large result sets is easy and should definitely be part of such benchmarks, because in the case of a large result set, any flaw will multiply drastically, so fixing these things is worthwhile. However, these problems only affect actual result sets, not the query building process or the execution process. Sure, most statements are probably queries, not insertions / updates, etc. But this needs to be kept in mind. All of the above scenarios are different optimisation sessions and deserve their own blog posts. In this post, I’m describing what has been discovered and fixed when running a single query 3 million times on an H2 database. The H2 database is chosen here, because it can run in memory of the same process and thus has the least extra overhead compared to jOOQ – so jOOQ’s overhead contributions become significant in a profiling session / benchmark. In fact, it can be shown that in such a benchmark, jOOQ (or Hibernate, etc.) appears to perform quite poorly compared to a JDBC only solution, as many have done before. Benchmarks do not reflect real-world use cases! You will never run the exact same query 3 million times on a production system, and your production system doesn’t run on H2. A benchmark profits from so much caching, buffering, you would never perform as fast as in a benchmark. Always be careful not to draw any wrong conclusions from a benchmark! This needs to be said, so take every benchmark you find on the web with a grain of salt. This includes our own! The trivial query returns a ridiculous 4 rows and 4 columns, so the “R-loop” and “C-loops” are negligible. This benchmark is really testing the overhead of jOOQ query execution in a case where the database does not contribute much to the execution time. Again, in a real world scenario, you will get much more overhead from your database. In the following sections, I’ll show a few minor bottlenecks that could be found when drilling down into these such execution scenarios. As I’ve switched between JMC versions, the screenshots will not always be the same, I’m afraid. The mistake didn’t contribute a whole lot of overhead, only 1.1% to the sampled time spent, but it made me curious. In version 3.10 of jOOQ, the SelectQueryImpl‘s Limit class, which encodes the jOOQ OFFSET / LIMIT behaviour kept allocating this DSL.val() thingy, which is a bind variable. Sure, limits do work with bind variables, but this happened when SelectQueryImpl was initialised, not when the LIMIT clause is added by the jOOQ API user. This is obviously better! Not only does it avoid the allocation of the bind variable, it also avoids the boxing of Integer.MAX_VALUE (which can also be seen in the sampling screenshot). * Shared empty array instance used for empty instances. When you initialise an ArrayList without initial capacity, it will reference this shared instance, instead of creating a new, empty (or even non-empty) array. This delays the allocation of such an array until we actually add things to the ArrayList, just in case it stays empty. jOOQ’s LIMIT is the same. Most queries might not have a LIMIT, so better not allocate that MAX_VALUE afresh! jOOQ (unfortunately) occasionally copies data around between arrays, e.g. wrapping Strings in jOOQ wrapper types, transforming numbers to strings, etc. These loops aren’t bad per se, but remember, we’re inside some level of the “S-E-R-C loop”, so these copying operations might be run hundreds of millions of times when we run a statement 3 million times. So, the implementation of the method guaranteed a new array as a result. After a bit of analysis, it could be seen that there is only a single consumer of this method, and it doesn’t leave that consumer. So, it’s safe to remove the clone call. Probably, the utility was refactored from a more general purpose method into this local usage. There’s a costly overhead in the CombinedCondition constructor (<init> method). Notice, how the samples drop from 0.47% to 0.32% between the constructor and the next method init(), that’s the time spent inside the constructor. There’s a loop over the arguments to give some meaningful error messages. That’s a bit too defensive, I suspect. How about we simply live with the NPE when it arises, as this should be rather unexpected (for the context, jOOQ hardly ever checks on parameters like this, so this should also be removed for consistency reasons). The nature of the JDBC API forces us to work with ThreadLocal variables, very unfortunately, as it is not possible to pass arguments from parent SQLData objects to children, especially when we combine nesting of Oracle TABLE/VARRAY and OBJECT types. Don’t forget calling Blob.free() et al, if you’re working with JDBC directly! Note that every allocation, apart from the overhead of allocating things, also incurs additional overhead when the object is garbage collected. That’s a bit trickier to measure and correlate. In general, less allocations is almost always a good thing, except if the allocation is super short lived, in case of which stack allocation can happen, or the logic can even be eliminated by the JIT. We’re no longer allocating the ArrayList (that might be premature, the JIT might have rewritten this allocation to not happen, but OK), and we’re only adding the LoggerListener if it DEBUG or TRACE logging is enabled for it, i.e. if it would do any work at all. That’s just a couple of CPU cycles we can save on every execution. Again, I don’t have the profiling measurements anymore, but trust me. It helped. As can be seen, the name is really the beef of this class. It’s a qualified name that generates itself on the SQL string. The Table representation is useful when navigating the meta model, but this is hardly ever done by jOOQ’s internals and/or user facing code. Because name is final, we could call table “effectively final” (in a different meaning than the Java language’s) – we won’t have any thread safety issues because these particular types are immutable inside of jOOQ. But once we’ve optimised, we shouldn’t stop. I’ve done a couple of individual JMH benchmarks for many of the above problems, to see if they were really an improvement. But sometimes, in a JMH benchmark, something that doesn’t look like an improvement will still be an improvement in the bigger picture. The JVM doesn’t inline all methods 100 levels deep. If your algorithm is complex, perhaps a micro optimisation will still have an effect that would not have any effect on a JMH benchmark. Unfortunately this isn’t very exact science, but with enough intuition, you’ll find the right spots to optimise. As can be seen, in both JDK versions, we’ve gotten roughly a 10% speed increase. What’s interesting is also that JDK 8 seemed to have been also 10% faster than JDK 9 in this benchmark, although this can be due to a variety of things that I haven’t considered yet, and which are out of scope for this discussion. Individual improvements are quite hard to measure, or measure correctly. But when you do 10-15 of them, they start adding up and become significant. 10% can make a difference. Looking forward to your comments, alternative techniques, alternative tools, etc.! Maybe the performance difference between Java 8 and 9 can be explained with “JEP 248: Make G1 the Default Garbage Collector.” You could retry by using the old GC?